It has been so long since I saw my old typewriter that I had given it up for lost. I lent it to my brother in the early 1990s so he could type up his archaeology thesis. I assumed it had gone missing during his various house moves and I just forgot about it. Then he revealed that it was stored in his garage. It has taken months to extricate it, but finally I have it back. What a mixture of emotions a machine can stir. 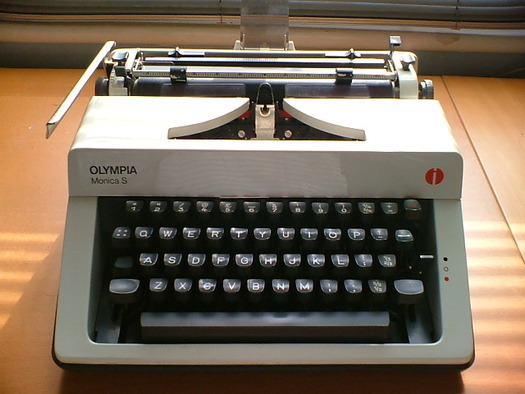 I bought my Olympia Monica S in Croydon, south London, from an office supply shop when I was 20. It was a decisive moment. I wanted to write and a typewriter was the essential tool of the trade, an instrument every bit as vital as a paintbrush is to a painter or a guitar to a guitarist. Longhand was never an option. Acquiring a typewriter, particularly if you had no plans to become a secretary, was a sign of identity, a declaration of commitment and intent. After two failed attempts to teach myself to touch-type on another machine, investing in my own obliged me to get serious and stick with the exercises for a month until I had disciplined my fingers to find the keys without looking. Examining my Olympia again, I'm struck by how powerfully its form and image embody and express the idea of writing, as does almost any typewriter. Like the telephone at an earlier phase in its development when it still had a distinct earpiece and mouthpiece at either end of a handle, the fully evolved typewriter is a 20th-century industrial archetype. It feels inevitable, almost elemental, like one of those object types, such as a chair or a fork, that simply had to exist in this universe of forms. Even now (but for how much longer?) a typewriter is the icon to show if you want to convey the idea of a dedicated literary life. The title page of The Rough Guide to Cult Fiction — just out — shows a portable typewriter on a desk with other writing paraphernalia. Turn the page and the caption reads "The essential equipment of a cult author, as collected by William Burroughs." Burroughs receives the longest entry in the book. The ultimate cult author — the ultimate writing machine. I did quite a lot of unpublished writing on my Olympia, but by the time I became a journalist in 1984 the PC had arrived. Word processing's advantages were obvious and I was happy to upgrade. You can't just brush the keys of a manual typewriter. You really have to hit them. That character has to arc through the air on its metal stalk and thwack the ink on to the paper. Correcting errors is messy and boring. Redrafting is worse. Typing can be an unglamorous slog. I operated PCs and later Macs at work and bought a Compaq portable computer the size of a small suitcase for a ridiculous sum and used its tiny green screen to "keyboard" the text of my first book. For years, I treated computers as little more than glorified typewriters with a memory and a built-in word counter. The point, of course, is that the computer has never been a dedicated writing tool — writing is the least of it — and everyone uses them. They are somehow both more marvellous and more ordinary. That's why there isn't a shred of romance in the idea of a writer and his or her personal computer. Today, antique typewriters have become collectables. Companies dedicate themselves to finding rare machines and restoring them to working order. Olympia is still making typewriters and, incredibly, there are even a few manual models still in production. It seems I could buy a replacement ribbon for my Monica S, gently ease the "n" which is sticking, blow off the dust that's somehow crept into her during her long years of inactivity, and take her for a spin for old time's sake. For most people, though, typewriters have become museum pieces — one of the few places you can still rely on seeing them. This wandering Olympia is the first example my 13-year-old daughter has had the chance to examine close up. I always liked the look of my first and only typewriter, though I barely thought in terms of design when I bought it. Returning to it now, I can see that it is a fine piece of late 1970s modernism. The grey plastic cover, with carrying handle, fits over the machine like a skin, forming a continuous surface with the typewriter's grey base. The carriage return is low, straight and unfussy so it can tuck inside. The light grey plastic shell is reduced to simple flat planes, but the angularity is softened by rounded edges and corners. It has the look of a bigger office machine scaled down to the size of a portable. The mechanism is well protected by its case, though the carrying handle has snapped off since I last saw it. For the most part, the Monica S is rather more durable than it needed to be. Its simplified contours anticipate the boxy designs of the desktop computers that would begin to render it redundant just a few years later. Even so, it has a lot more character than an early IBM PC or a typical recent laptop. The typology of the typewriter has an expressive richness and a symbolic heft way beyond the design achievements of even the fanciest digital appliances. They would have to start rationing the electricity supply, though, before I would willingly go back. You can still have it both ways. Check out this conversion of a manual Smith-Corona into a computer peripheral. I never owned a typewriter but spent many hours with them in school libraries writing song lyrics. Like most teenage songsmiths the songs were about imagined or unrequited love. At some point my lustful desire must have conflated with the love of the letterforms laid prostrate on the Qwerty keyboard. This romantic demarcation between typography and life continues to blur. The first piece of jewellery I gave my partner was a ring with a white ceramic typewriter key displaying a beautiful black capital sans serif 'A' under glass. We were recently married and the wedding ring (crafted by our friend, fantastic Australian jeweller Liz Shaw) consists of the tiny serif characters from an old Remington, cast in silver and set around a band. It lists the alphabet from A to R. A bigger finger could accommodate the entire keyboard. No one appreciates manual typewriters like kids who have grown up with nothing but personal computers. My daughter was asked in high school to do a paper on an invention and picked the typewriter. She found a guy in the neighborhood who was a collector and borrowed an inexpensive portable to bring to class. The machine created a sensation with here classmates (and even more with her younger brother and sister). No one could keep their hands off it. As Rick points out, in an increasingly digital age, these "analog" experiences still have the capacity to provide a sensual kind of pleasure. Call me crazy, but I'm actually a fan of the IBM Selectric, whose precision and uniformity was supposed to render these manual rigs obsolete. As it turns out, though, the same sort of quirkiness and variations of manuals--which launched a thousand dirty typefaces--still exists in the Selectric, albeit to a smaller, subtler degree. And though the typefaces of the Selectric have become invisible thanks to IBM porting them over to the PC world, I find there's still something distinct and kind of elegant about the typed typefaces of the Selectric. Meanwhile, a few old men like William Gibson rhapsodize about the kinaesthetic joy of the Selectric, which was the tech lust object of its day among writers. Nothing can replace the sound of your fingers hitting those keys, and the the arm hitting the paper. I've an old Underwood sitting next to my Sinclair, Apple IIE and MacPlus computers. My father brought home the Underwood one day from a thrift store just to give us some perspective, "This is technology too." I went back to "drawing" in MacPaint. I used to play with the Underwood just for its brutality. The Sinclair always looked so much cooler by comparison—streamlined. I felt like I had a lot of power in that small box, like a laptop before the laptop. This all makes me nostalgic, but in a couple of years, I expect to see my G5 sitting next to them all, waiting to be wiped down with a dust cloth too. 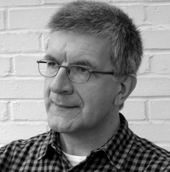 Thanks for pointing out the typology article, Rick, looks lively. Then there's Ed Ruscha and Mason Williams and their Royal Road Test, a piece of performance art that involved throwing a typewriter out the window of a moving car and documenting the aftermath like a crime scene. As Hemingway said, "Typewriters write like people talk." I always type the first draft of my dialog before entering it into the word processor. Which typewriter? A Remington Noiseless Portable for English, a Smith-Corona Silent for Spanish. Two days ago, there was a typewriter sitting on the "free" table of my apartment building. I paused and stared at it, caught in indecision. On the one hand, a typewriter! On the other hand ... a typewriter. I walked on. I wonder sometimes if my sensitivity to typography might be traced back to the letters my parents sent me at summer camp. My father's no-nonsense midwestern voice was perfectly embodied by the 10-pitch Prestige Pica of his IBM Selectric II; Mom's sensitivity to language (and arch wit) was matched by the proportionally-spaced "Sans Serif" of her rarefied IBM Executive. I realize now that my parents chose the typewriters they found most satisfying, but growing up I might have imagined the reverse -- that their typewriters had been provided to them as natural extensions of their personalities. Of course Dad, with his interest in all things visual, could change fonts in a snap, literally. Of course Mom, with her facility for all things verbal, could write correspondence that looked like publisher's galleys. Somewhere, there must be someone practicing the industrialized successor to "graphology," which posits personality traits based one's choice of typewriter. (Looking back casually, I find myself easily extrapolating my piano teacher from her Remington, and my neighbor from his bright orange Olivetti.) More chillingly, I wonder if it was because I grew up in the joint custody of proportional spacing and multiple font selection that I experienced such a profound joy in 1984, when Apple introduced the Macintosh. I have always been fascinated by intricate mechanical mechanisms, and since I am an academic with a fair amount of writing to do, typewriters became a natural interest for me. I regularly turn my back on the computer in my office and pull my chair up to one of my antiques to tap out a handout or quiz. When is the last time you were given a quiz produced on an early Underwood Standard 4, or a handout on phobias done in PrinType font on an Oliver model 9? I sometimes tell my students about the machine that produced the document in their hands, but usually all I get is blank stares. Some of them smell the paper, expecting perhaps the whiff of oiled steel and ink? I've never used a typewriter, but I sometimes wish I had for some of the reasons mentioned above, for a nostalgia of great writers and for the slow, physical sense of writing. I do a lot of writing on paper in a notebook though, which I guess is taking it a bit further. But I have to say the Apple Powerbook's keyboard has an amazingly fluid feel that is unlike any other computer I've used and once you start using it, you become quite attached to it. Perhaps the Mac (Powerbook) is the new typewriter. Call me crazy, but that typewriter was probably manufactured in my hometown, in the factory my dad was working for. In his excellent new(ish) book, Derek Birdsall describes how he uses his Olivetti Lettera 22 portable (designed by Marcello Nizoli in 1949) to keep notes on index cards. These notes are the basis for much of his research and ideas. I imagine the flexibility of this system allows him to browse through ideas, picking out the cards etc. I have tried the same idea but on my computer and it just doesn't work. Opening and closing documents just doesn't have the same feel about it. I've tried to figure out why and my conclusion is that older technology don't consume me in the same way that computers do. I can't remember the last time I looked out the window, or daydreamed as I worked on my computer. However, this was a regular event whenever I tried to type out documents on my typewriter, even my electric Brother. I think older technologies (including letterpress) give space for our imaginations to roam while digital technology inhabit the 'mind's eye' in some way. The typewriter thing is strange. I still have some of mine, though I have not seen them for years. They're in Canada, I'm in Korea. I've been writing on computers since 1980, and there was nothing about typing on those machines that I prefer to using a computer. But I'll never get rid of the ones I have left, an IBM Selectric, an Adler portable, and three Olympia portables, including an SM9 I bought new in 1976, and a SM13 that my father bought in 1956 (my favourite) and a tiny one I can never remember the name of (about the zize of an Olivetti Lettera 22). I can't wait to dust them off, find ribbons for them -- and put them back in their cases. Connection between finger, key and letter on the paper is the attraction of the manual typewriter. How satisfying the unique, vibrating, ratcheting rhythm of the carriage return. The accompanying sounds confirm a human presence. Understanding the mechanics allows a relationship to develop between man and machine. Computer generated text requires limited physical contact in the same way that washing machines provide clean clothes with minimal manual handling. The carriage return is no more but its silent intelligence exists on a higher level. Memories... for some reason I still find humor in making the ding sound when I reach the end of a corn-on-the-cob row. In 1882, Friedrich Nietzsche temporarily used a Hansen Writing Ball. In a letter to a friend, he notes: "It's true - our writing tools help shape our thoughts. When will it cross my fingers to press a long sentence!". Scans of Nietzsche's type writings (PDF) show a sans-serif that seems at odds with the intricate machine that produced it. I bought myself a Remington Streamline Portable half a year ago, my first contact with a manual typewriter, and I couldn't be happier. My parents still don't understand my infatuation with the machine, and frequently complain about the rattling of the keys when I'm on a roll. "Remy One" is now one of my favorite possessions, despite the fact that ribbons are no longer produced for that paticular model (I make do by rolling them by hand onto the spools). This picture reminds me of ClockWork Orange.